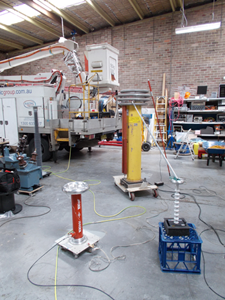 All tests and measurements are made with instruments traceable to Australian National Standards, by staff highly experienced in testing measurement and calibration related to the electrical power industry. The particular capabilities that are within our NATA Scope of Accreditation are identified by NATA. Tests/calibrations outside the NATA Scope are identified with '(traceable)'. 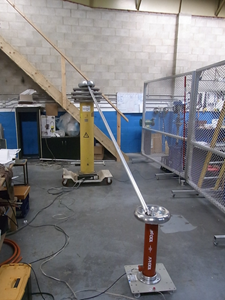 Multiple configurable safe, interlocked test areas.  Testing Transformer: 10 kVA (20 kVA 30 minutes), up to 100 kVrms at 50 Hz, with short-circuit protection. 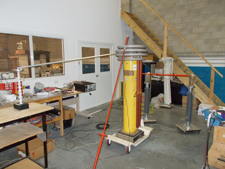  300 kVrms EWP Test Set, 3.6 kVA resistive, or up to 50 kVrms at 7.2 kVA capacitive load; leakage current measured.  At voltages up to 5 kVdc, from 1 MΩ to 100 GΩ.